Tired of listening to people talk about The Jersey Shore? Good news: There's now a TV remote that'll help you avoid hearing about stuff you'd rather avoid. These days, it's pretty much impossible to watch television and not be inundated with "news" about petty celebrity drama, immature political bantering, and or how videogames are pushing evil environmental agendas. That said, it's tough to avoid these topics if you still want to stay informed about what's happening, so what's the discriminating media consumer to do? Well, if you're Matt Richardson, you build a TV remote so it'll mute out the audio that you don't want to listen to. For Richardson, who works from home and spends a lot of time with the TV on so he can stay informed of the goings-on out in the world, there were a number of people/topics that he had no interest in hearing about. "A while ago it was Charlie Sheen. And then it was Sarah Palin. And then it was Donald Trump," he said. "And after a while I realized there's sort of always someone who I don't really want to hear about." 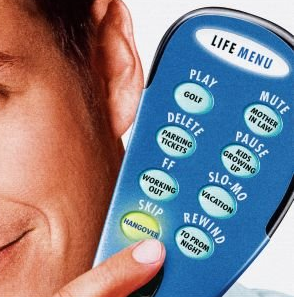 As a result, the video producer for Make Magazine hacked a TV remote that would automatically mute television when certain celebrity names were mentioned. The way it works is that the hacked remote reads the close-captioning transcripts as they're aired, and will automatically mute the TV for thirty seconds when specified words are picked up. Of course, the device isn't perfect, since closed captioning doesn't always scroll fast enough to keep up with the action on screen, but when it first worked, Richardson "was in silent bliss for that 30 seconds I didn't have to hear about Kim Kardashian." Since Richardson constructed this remote with Arduino - an inexpensive piece of computer hardware that can pretty much be programmed to do anything its user wants - he's planning to unveil the device's blueprints at the upcoming Maker Faire in New York. Someday soon, my friends, I envision a future full of muted "real" housewives and talking heads on Fox News, and the silence will sound glorious.